Travelling with kids? Cayman is a great place to plan a family vacation for so many reasons – it is very safe, easy to navigate and almost all places cater to children. Add beautiful white sand beaches and warm temperatures for most of the year and you can’t go wrong with this Caribbean paradise! This is one of the most kid-friendly locations on the island. With a number of great restaurants and nice shops, it should be on the top of any tourist’s to-do list. Grab a bite at one of the restaurants facing the fountains on the Crescent while watching the kids play in the water. It is a great way to spend an afternoon for parents and kids alike. Camana Bay also hosts an array of fun family activities, including weekly story-telling sessions for children on Tuesday mornings at the movie theatre. For more info, visit their website. Seven Mile Beach, with its gorgeous white sand, fun sea & water activities and calm waves (most of the time!) is the place to spend most of your sun-filled days. If you are staying at our Beach House, we offer a fantastic Kids’ Club, which is led by the energetic Kathryn. She organizes a lot of fun activities for the kids to keep them entertained, such as making S’mores at a bonfire, bracelet making, scavenger hunts, water balloon fun and star gazing on the beach (just to name a few!) She also hosts a Pajama Party on Wednesdays (so parents can enjoy a night out) where children play games, do arts & crafts, and watch a movie. This is another fun beach destination. About an hour’s drive from Seven Mile Beach, Rum Point is a great day excursion for the family. With its calm and shallow waters and fun sea & water activities, there is a lot to keep both the old and young occupied. There is also a beach bar that serves the “best” frozen mudslide drinks on the island. Local legend says that the world’s first mudslide was made there and apparently the bar serves more than 400 of these beverages a day! Swim, touch and kiss these mild mannered stingrays. It is a once in a lifetime experience! For more info, visit their website. Situated in a lush tropical forest in Northside, the Crystal Caves is the island’s newest nature tourist attraction. 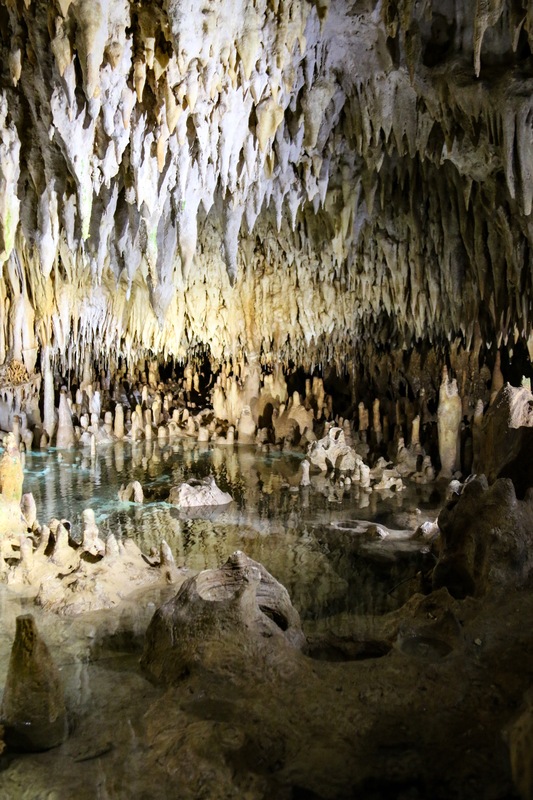 You will venture into amazing caves where you’ll see stalactite and stalagmite crystal structures and otherworldly formations, formed by single drops of water and the slow passage of time. Tour through the unique tropical forest nature, under which the caves formed. Amongst the forest and caves is captivating tropical plant and animal life, including strangler balsam trees, air plants, parrots, and bats. For more info, visit their website.